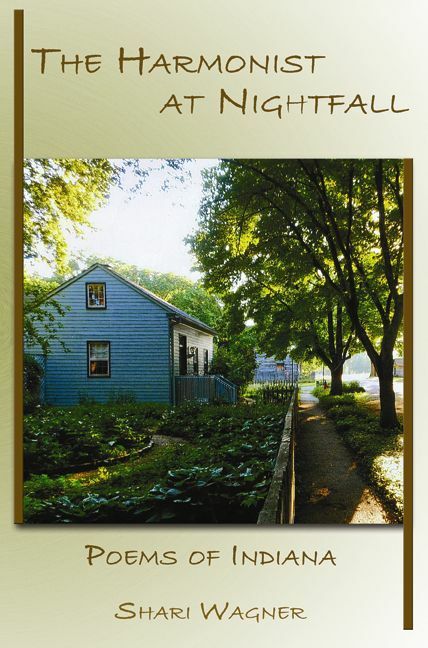 Today's book of poetry: The Harmonist at Nightfall, Poems of Indiana. Shari Wagner. Harmony Series. Bottom Dog Press. Huron, Ohio, U.S.A. 2013. The Harmonist at Nightfall, Poems of Indiana is exactly as advertised. Within these pages Shari Wagner gives a physical, cultural and historical portrait of her home state. Not exactly set yourself on fire material at first glance, but I've always believed the subject was less important than the poet's vision, that a good poet can make a platform out of every subject and Shari Wagner is a very good poet. That sounds like such a back-handed compliment and clumsy as well. For this reader poems about nature and history are not my first fodder. Wagner doesn't worry about stereotypes, when she is describing Indiana you can smell the earth. Wagner is writing poems about place, her place in the world, and articulating the theory that her place, like yours, is as vibrant, alive and important, as any other. when he couldn't find his cows. what might have been their bells. You can see the Indiana soil, the very earth beneath Wagner's fingernails, you can hear the song of Indiana in her voice. But this isn't patriotic flag waving and marching bands. This is Wagner giving voice to the land, to nature, Wagner is the Harmonist in question and these nature poems hum the land electric. But there are more than nature poems in The Harmonist at Nightfall. Karen Kovacik, another Indiana poet, called The Harmonist at Nightfall a "field guide and travelogue" and she was right on the money. with its door left ajar. These poems are not just a psalm about the natural world and natural wonders of Indiana but they also cover history, culture, religion, rumour and legend. Shari Wagner honours the history of Indiana and many of the luminaries who carved its' story but these poems work because of Wagner's sure footing, her nimble footwork. During the course of events in these poems the Dali Lama floats a scarf over the grave of John Dillinger, the moonshine soused Etheridge Knight is lamented, President Harrison's final resting place doubles as a darkened rendezvous for daring lovers. The sound a waterfall makes is the sound of a billion bison. Sheri Wagner romps historical, waxes eloquent and writes very fine poems. I will quiet that wheel. "Sleigh bells mixed with thunder", that line knocked me out. It was a trick Sheri Wagner pulled off frequently during The Harmonist at Nightfall. This book was a complete happy surprise and a great read. And just as an aside, I now cannot get the old R. Dean Taylor song "Indiana Wants Me" out of my head.